Ian James Corlett, Erika-Shaye Gair, Nico Chisi et al. 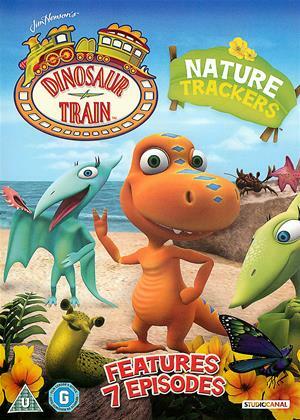 "Dinosaur Train" embraces and celebrates the fascination that preschoolers have with both dinosaurs and trains while sparking an interest in Life Science, Natural History and Palaeontology. When the kids build a nest on the beach, they get the idea to turn it into a clubhouse and the "Nature Trackers" club is born! The only problem is: who is in charge of the club? When Tiny finds her favourite buttercups have wilted, Mum takes her and the family to the Big Pond, where she remembers seeing a whole lot of buttercups in bloom. Tiny sees her flowers both blooming and wilting, and can see nature's life cycle in action. The kids gather seeds at the Big Pond, which they bring home to plant in their new garden. They meet Sammy, a friendly slug, who explains that slugs, spiders, and butterflies all help to make a garden complete. When Mrs. Pteranodon cleans out the family nest, the kids are amazed at all the stuff being thrown away. Tiny stops Mum from throwing out all the stuff, and the Pteranodon kids have fun making nature art on the beach using the items from the nest. Shiny faces her fear of snakes when Tiny challenges the Nature Trackers to meet the ultimate snake: the Sanajeh, a huge Cretaceous snake from what is now India. Dad takes the kids on the Dinosaur Train to find Sana Sanajeh, who may be huge, but turns out to be quite friendly! After a hurricane, the family discovers a raft of logs has washed up two refugees from across the Sea. They decide to take their new friends to the Dinosaur Train, and ride back with them to their home in Appalachia. When the kids enter a contest at a party at the Big Pond, Keenan Chirostenotes claims the Pteranodons can't enter because they are not dinosaurs. This launches the kids into a song called "That's Not a Dinosaur". In the end, the game rules are changed to include all creatures, even non-dinosaurs, in all the contests!